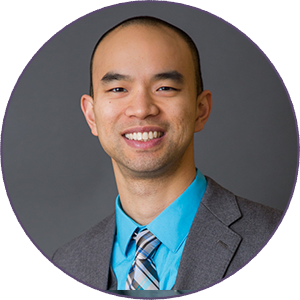 Dr. Colin Zhu is a family practice osteopath whose mother is a practicing physician in China, so the holistic approach to medicine was instilled in him from an early age. Eastern medicine — rather than the one-size-fits-all treatments typically prescribed in Western medicine — looks at the needs of the individual and their unique body in an integrative, preventive way, and can be a tool in the toolbox of a physician hoping to address and treat the prevalence of chronic illnesses. Dr. Zhu also has a passion for cooking, and has found this has become an integral part of the way he practices medicine. “I find that food is medicine, and it can be one of the best solutions to fighting America’s chronic disease burden,” he says. “I use my culinary background and marry it to medicine, and show how food can be used as medicine,” he shares. In addition to osteopathic medicine, he studied health-supportive and plant-based culinary arts. “This extensive immersion education combined with my own life experiences was my soul’s inspiration to create TheChefDoc,” he says. He helps his patients empower themselves to not only enhance their quality of life, but also that of their families and, by extension, their communities. Dr. Zhu has a passion for travel, and has found that he’s able to use locum tenens as a way to incorporate his career into his love of the culinary arts and medicine, and exploring the world. To this point, he’s visited 29 countries, and recently made it to Antarctica. The flexible schedule locum tenens allows gives Dr. Zhu the opportunity to see his family more often, travel, and pursue his passion for the culinary arts and educating as many people as possible about how nutrition and one’s overall health and well-being are intertwined. He travels around the world speaking at medical conventions, medical residencies, and nonprofit and specialty events, highlighting his three tenets as well as the transformative nature of nutrition in medicine. Locum tenens has made all of these pursuits a possibility. Dr. Zhu’s discovered that without the administrative burdens that come with a permanent position or owning his own practice, he’s found that he can spend more quality time with his patients. Being able to spend more time with his patients has been rewarded with happier and healthier patients, who constantly let him know that he’s the first doctor to have taken the extra time to thoroughly explain their diagnosis. “To them it’s more fulfilling, and it’s more fulfilling to me because I’m teaching them what’s going on in their body and with their health, and with time and education they’re empowered to do things in a different way, rather than just taking a pill,” he shares. Living the life of a locum tenens doctor full-time, Dr. Zhu has found that the work/life balance translates into better patient outcomes. “The more I can improve the quality of my life and by taking care of myself, the more I improve the quality of care I impart on my patients,” he says. And without the ability to control when, where, and how much he works with locum tenens, Dr. Zhu wouldn’t have been able to achieve his goals.